Velocir is and Albin Vega 27 built in 1973. Sometimes we wonder why so many people, us included, live in places that are so dreary and cold a good chunk of the year. We are reminded of this every time we use Grant’s birthday as an excuse to visit a tropical locale. Three years running. 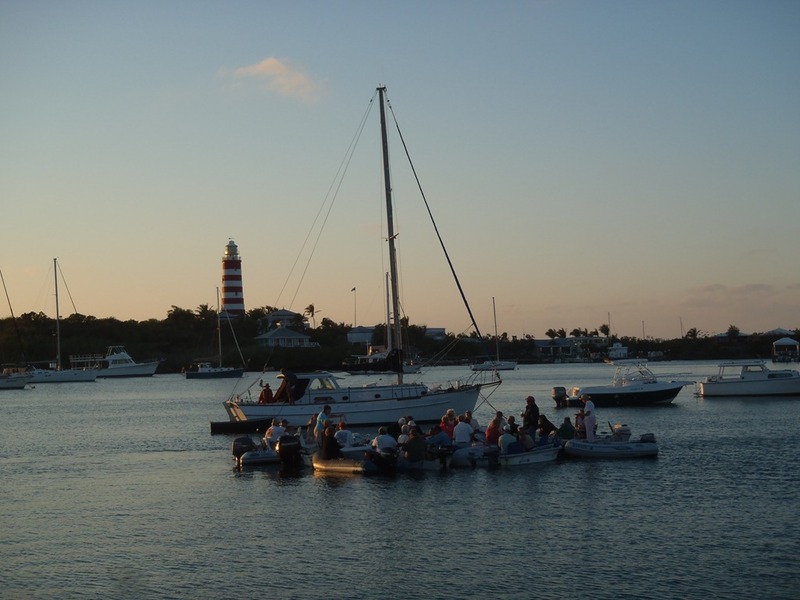 Last year was on Velocir in Spanish Wells, Eleuthera. 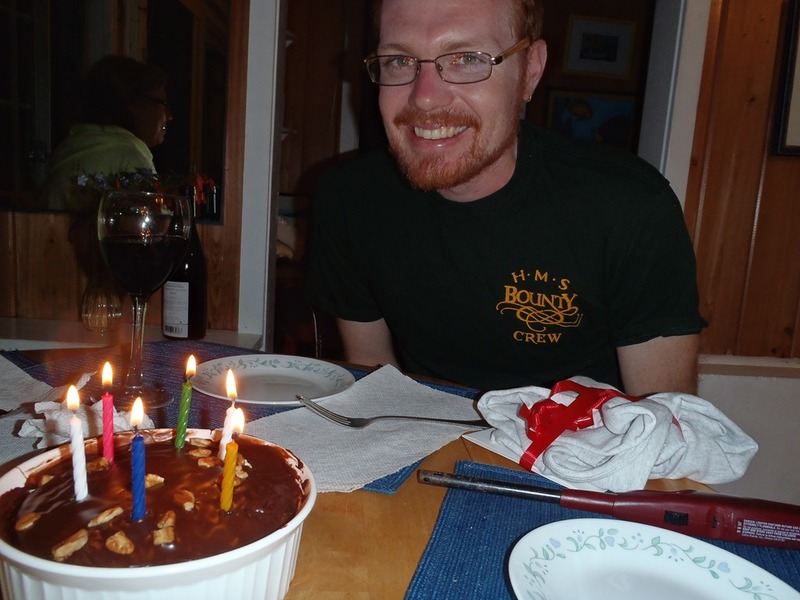 We made a delicious turtle cake, making do with whatever baking pans were available. For dinner, we skipped the sunset cruiser’s raft-up to enjoy some fine dining. We watched the sunset and the moonrise about 30 minutes apart. 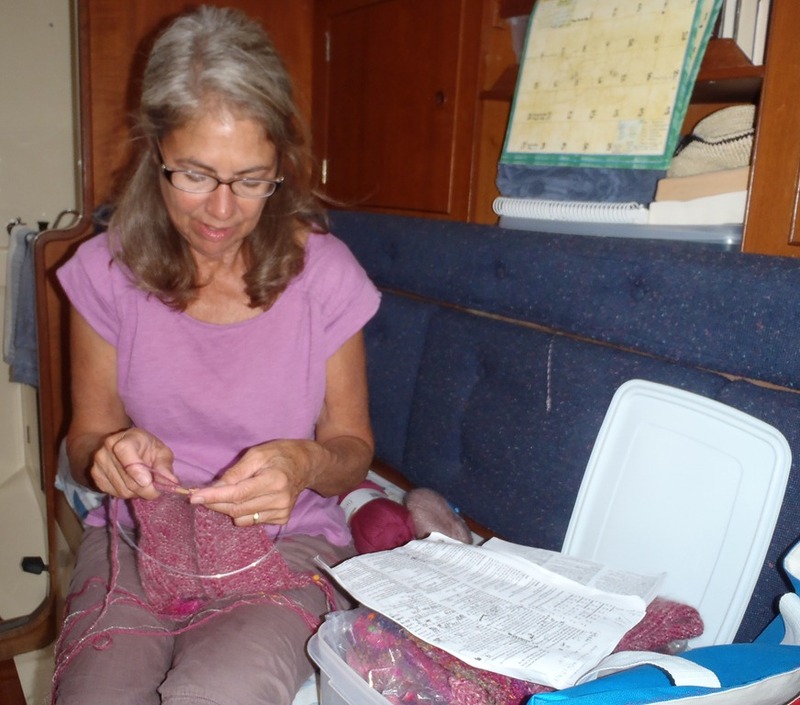 Besides birthday celebrations, we’ve been reading, knitting, snorkeling and walking the beach. Relaxing in the Caribbean! We stopped our lazy ways and got to work, taking Motu Iti out for a sail! The forecast was 10-15 kts with light chop. 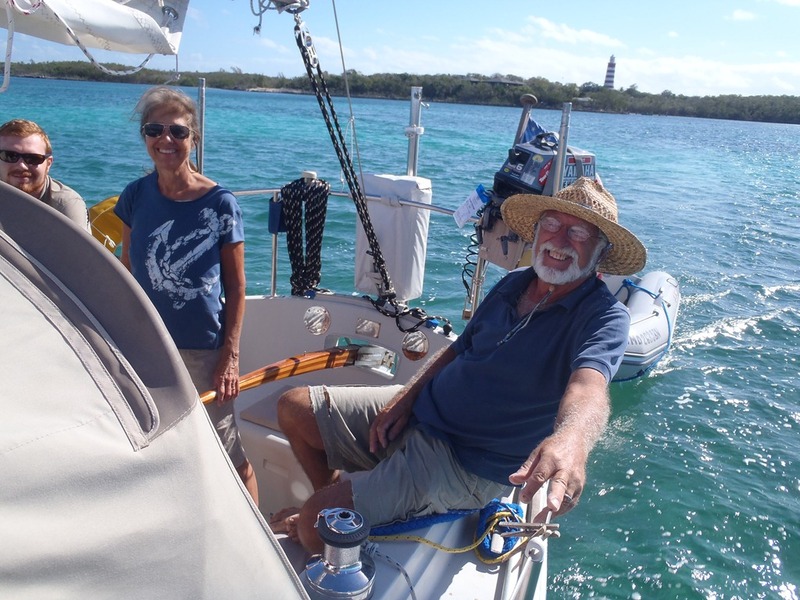 Sailing the Sea of Abaco, Motu Iti did a fine job gliding through the water, not wanting to heel too much even with some puffs. At the end of our sail, Amelia got in the dinghy and anchored it, while Motu Iti sailed back and forth to get some great photos. 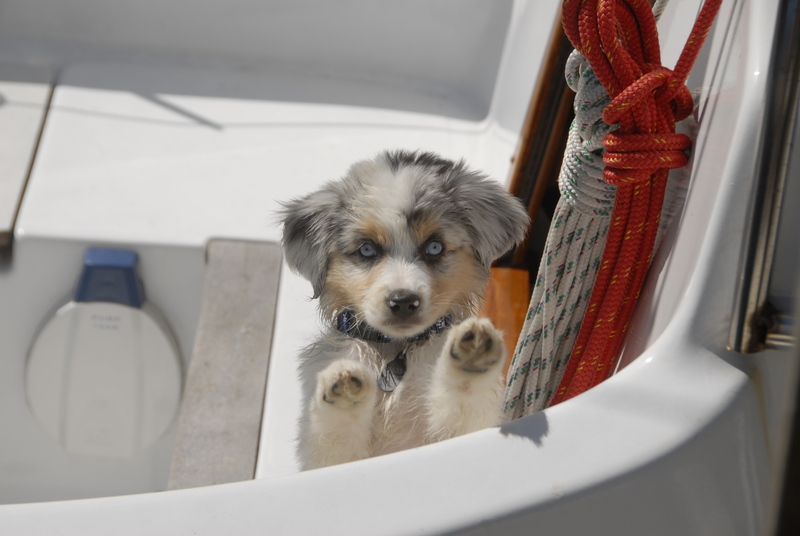 It’s hard to have good sailing pictures of your boat when you’re always on it! Good bye snowy Annapolis, hello Bahamas!! 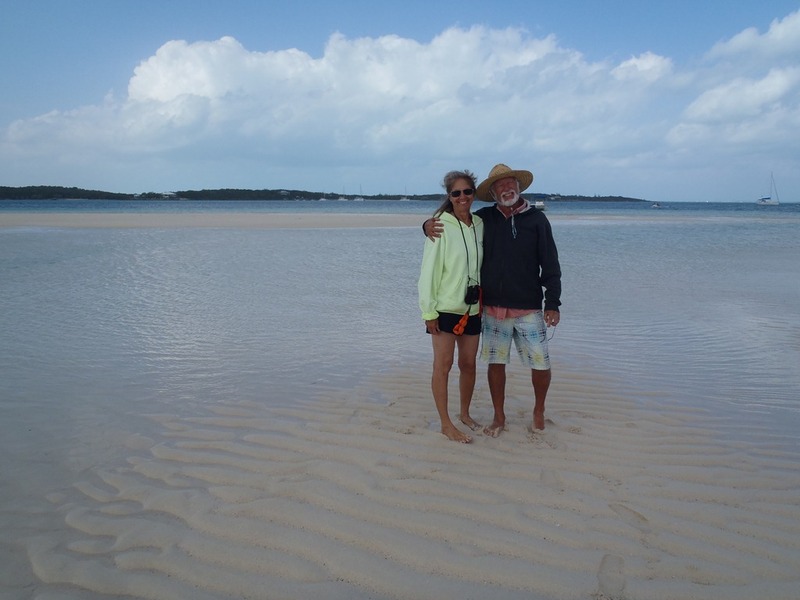 Goldwin and Nancy have been relaxing in the Abacos this last month, and we are very happy to join them. Our first day was a bit breezy, but we headed over to a favorite of ours, Tahiti Beach, for some low tide nature viewing. The beach is a long sand bar that appears at low tide. 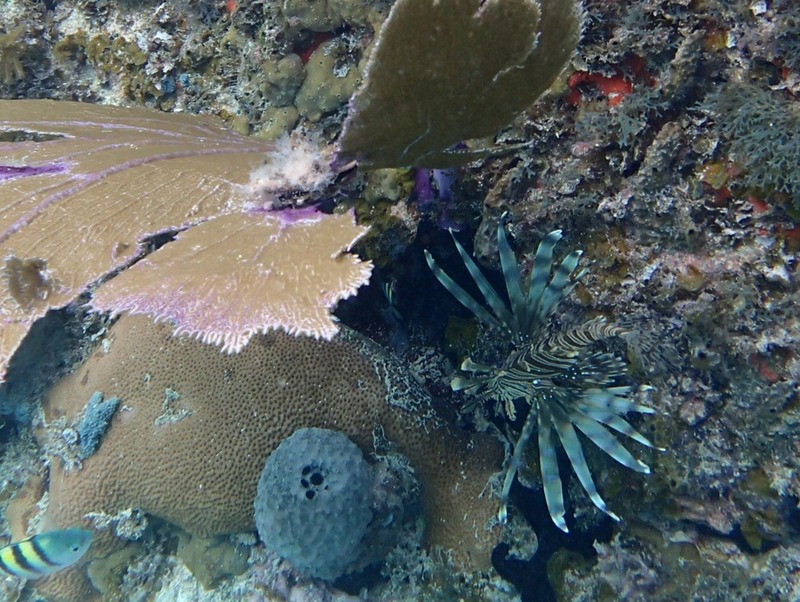 The area is full of starfish, sand dollars, juvenile conch and other creatures. 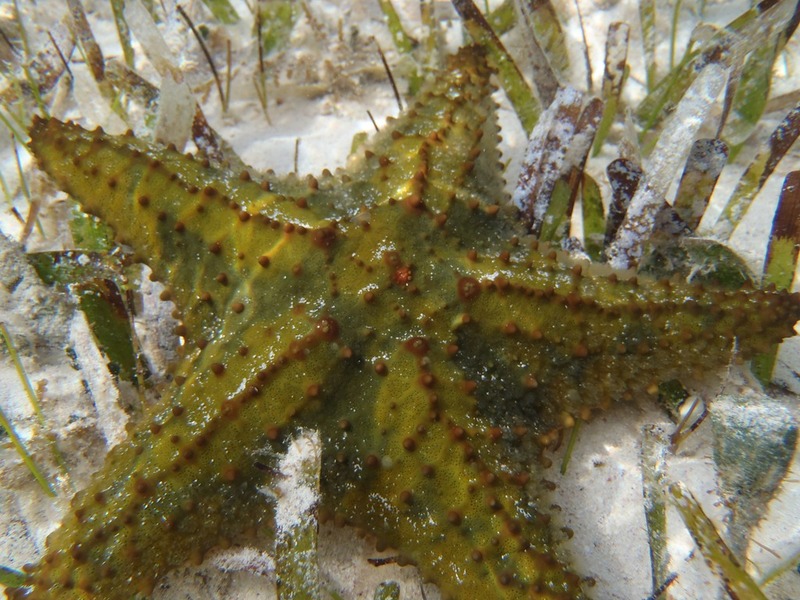 Even though we have explored these waters before we always find something new, like this green starfish. 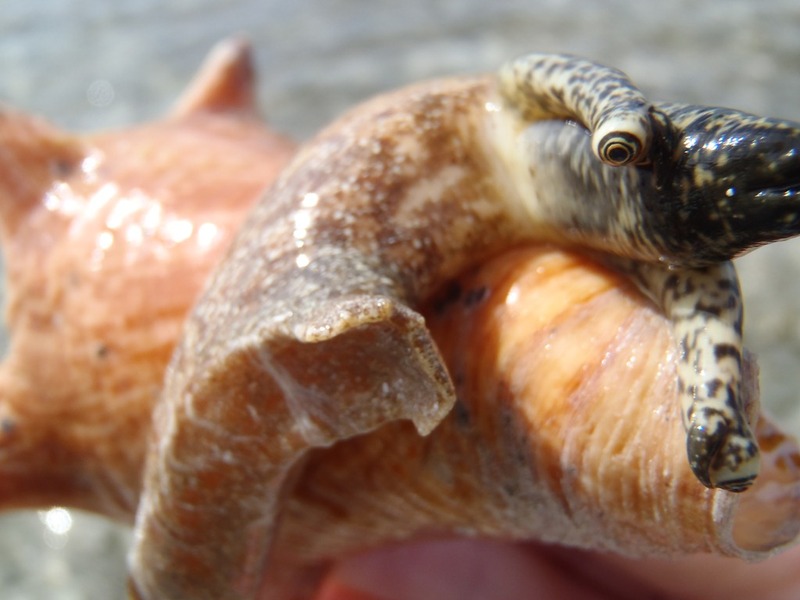 A rare sighting, this juvenile conch came out of its shell for us (trying to turn over). 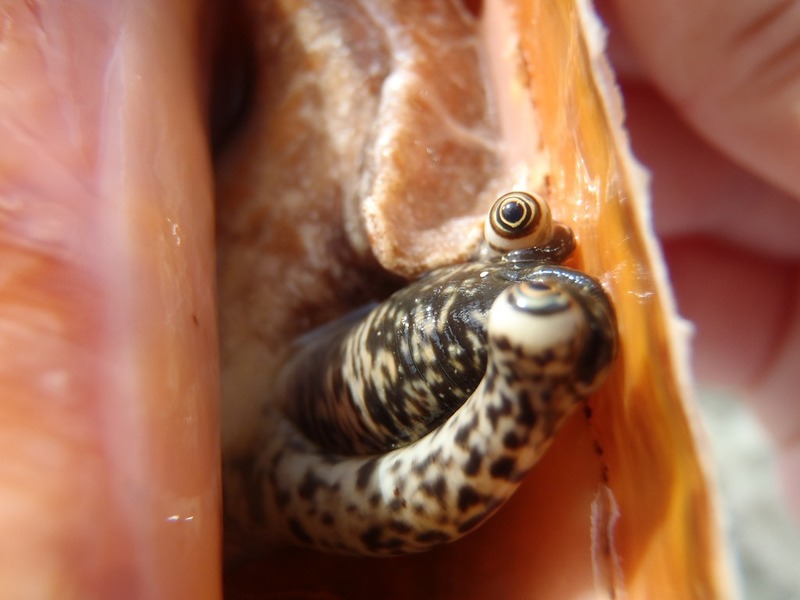 The eyes always get us, they are oddly adorable making them extremely hard to turn into a meal. Luckily this one is not legally large enough to eat. We zoomed around to a few good snorkeling spots. 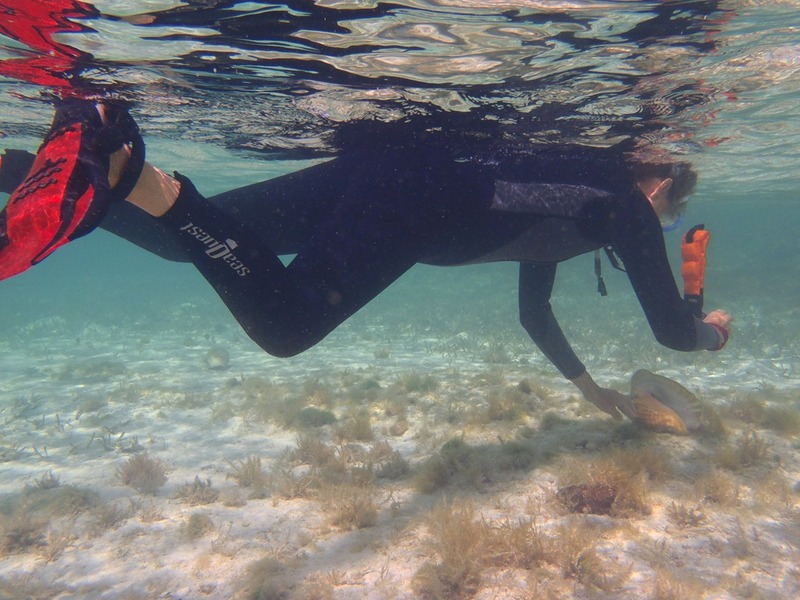 When Grant goes spearfishing he uses a pole spear with an elastic loop at the end (making it a homemade Hawaiian sling), dive weights to help him get down to look under crevices, a knife for safety and gloves to protect his hands from sharp lobster etc. 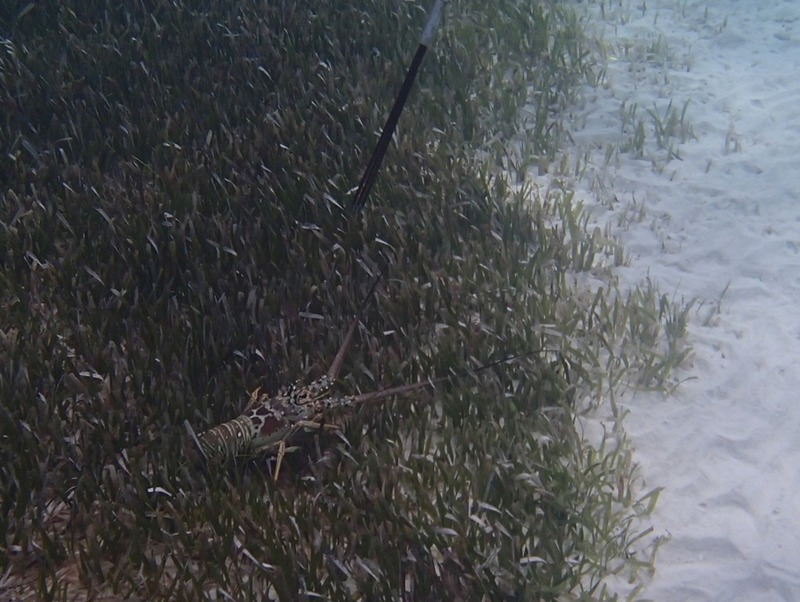 He found a spiny lobster in a grassy bank offshore, and speared it for dinner. 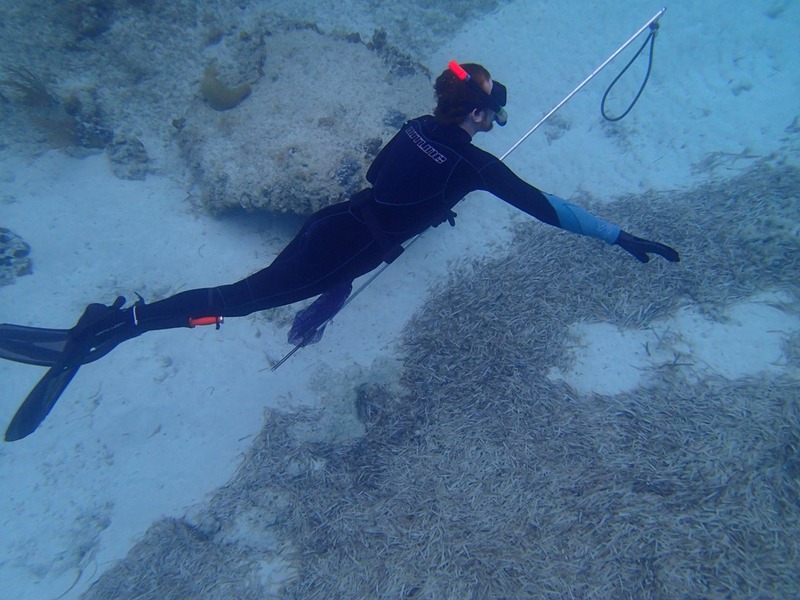 We also speared a few Lion Fish, an invasive species with no natural predators and dangerous spines. It is very much encouraged to spear them. 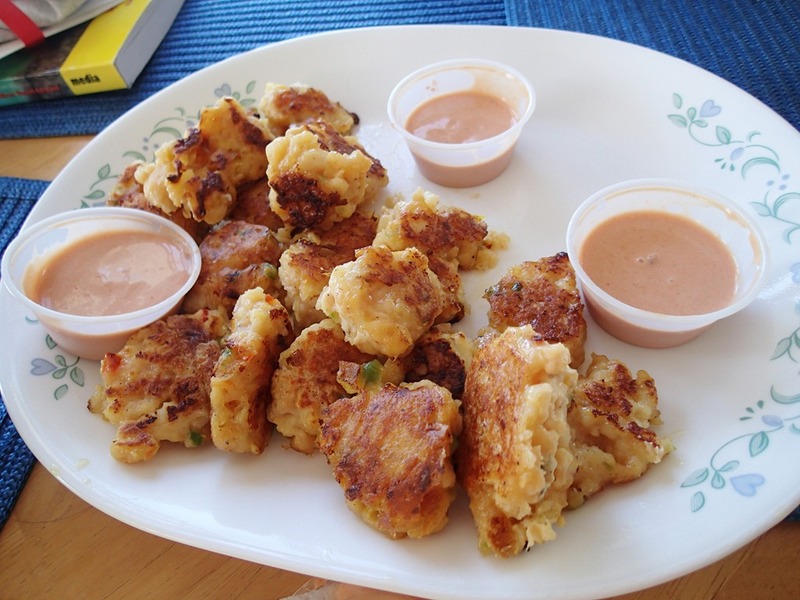 To finish our great day, Amelia made some conch fritters out of fresh-caught conch and a local batter Nancy had gotten. How time flies! 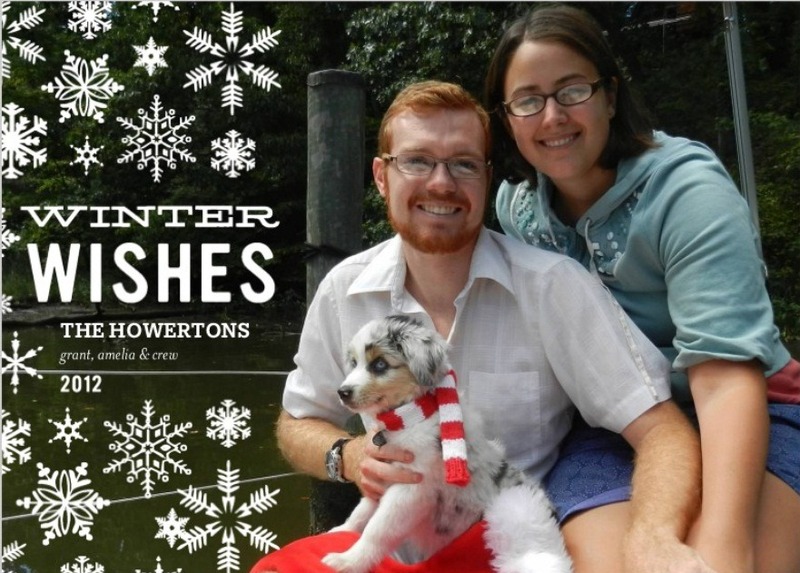 We are thankful for family and friends this holiday season. Grant is thankful for our good health, Amelia is thankful for a life full of joy and Crew is thankful for treats……anything for treats. Last month Velocir made it through hurricane Sandy’s strong winds unscathed. To prepare, we secured many lines to different connection points on Velocir and the dock. She was protected in her cove from the wind, so we just kept ready in case something happened but it was very mild. Our biggest fear was a tree falling, but luckily they held tight! This week we winterized Velocir in anticipation of the long cold winter months ahead. We used environmentally safe anti-freeze and emptied the water tanks. There was a little fish in our water filter, so we set him free. 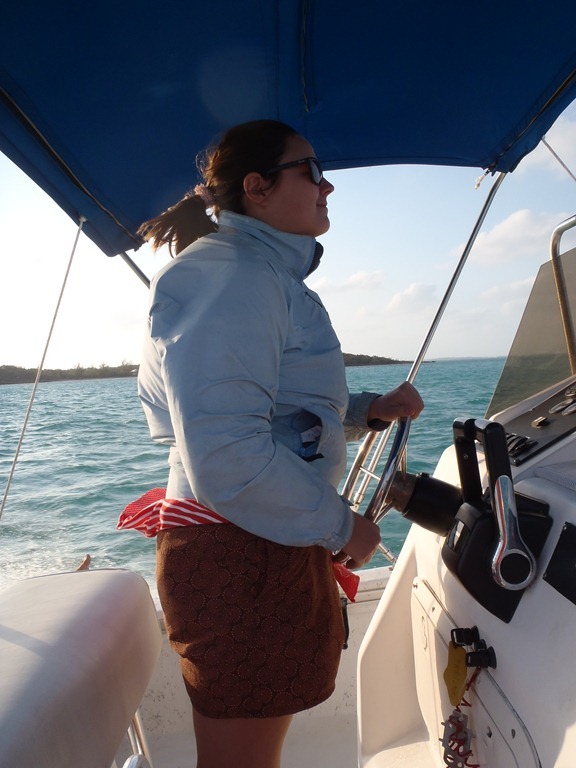 We even got out for a weekend sail with friends in mid-November, yay warm weather! The fall colors are a beautiful time to explore the tree-lined creeks of the Chesapeake Bay. So much to be thankful for. Happy Thanksgiving! We were not aboard Bounty– Our thoughts and hearts go out to our fellow crew members. 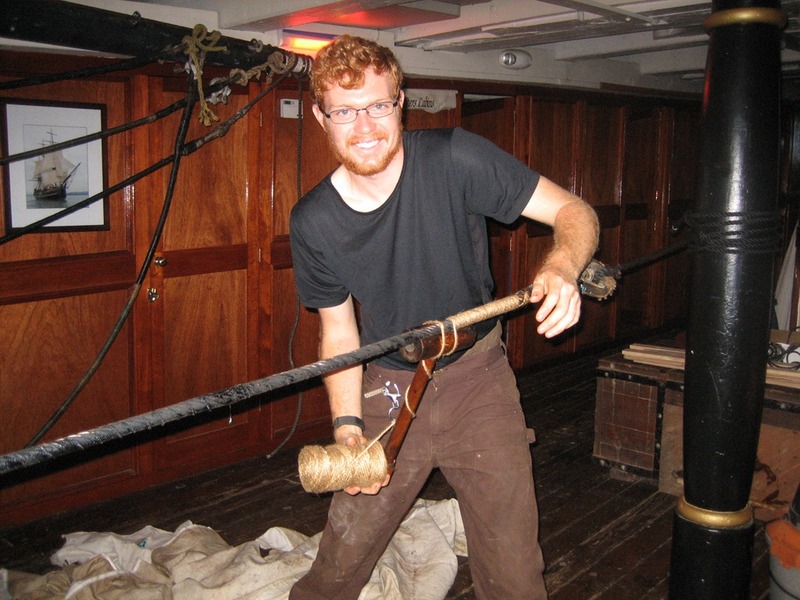 This past Spring we were crew aboard the tallship HMS Bounty. 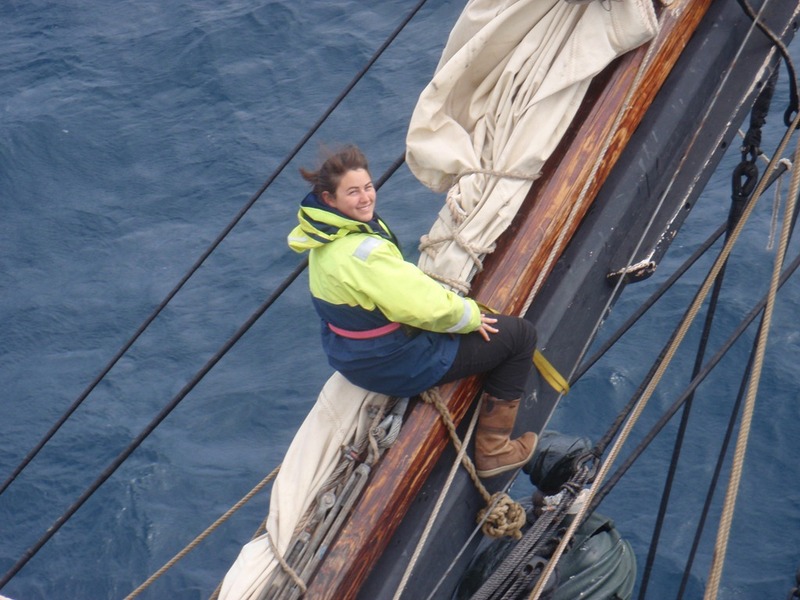 Many of you saw our blogs and video, as we shared what it is like to sail a traditional ship. 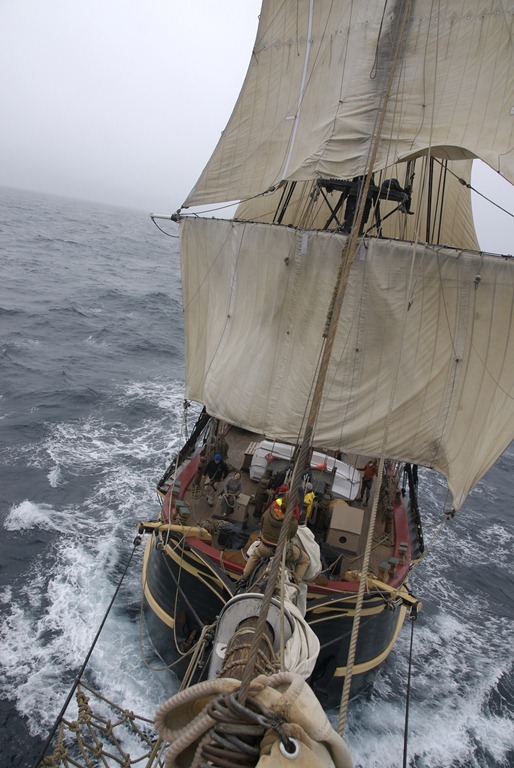 As you may now know, this morning the HMS Bounty sank off Cape Hatteras during hurricane Sandy. The ship sank beneath us, but we swam free and mostly got into two rafts. I’m at the USCG station Elizabeth City NC. There are two unaccounted for at present. This is tragic, terrifying news. With all our hearts we hope that the two remaining crew members are rescued. We have many memories on this ship. It is how we met, and where we had our first kiss. We are sorry she is gone, but angry that any life was risked in this way. 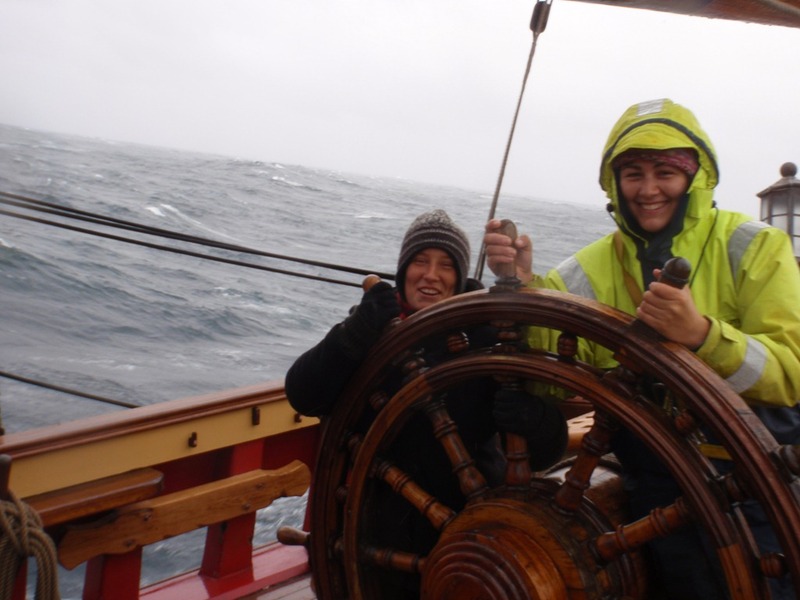 Please fellow sailors, be humbled by the weather. Bon Voyage to MOTU ITI! 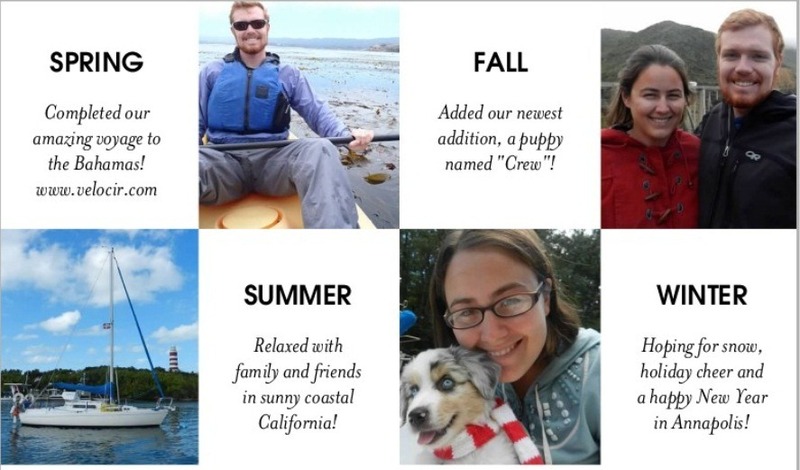 We are excited to share with everyone that MOTU ITI has officially left on their cruise this winter. 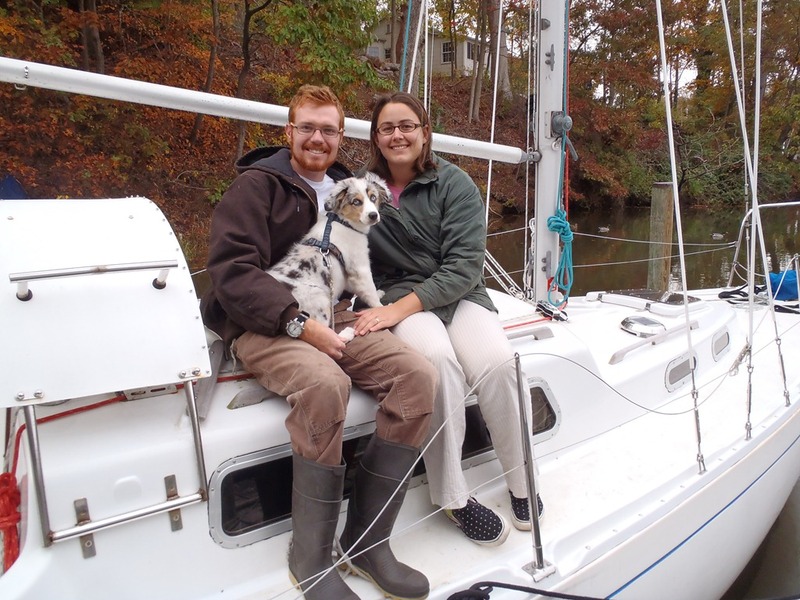 After a lot of work and planning, their cruising dreams have become a reality. They were the boat we featured in our “I’m On A Boat” Youtube series. Their small sailboat is a Camper Nicholson 31. 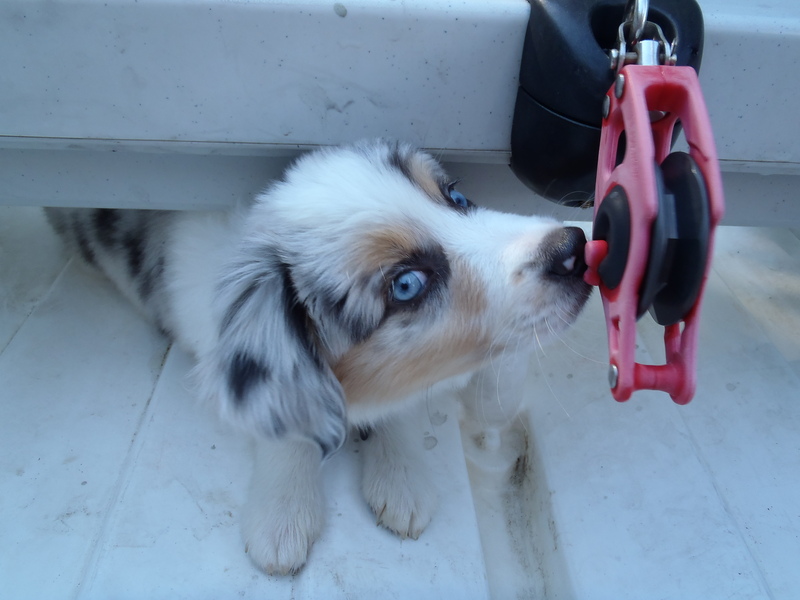 Check out their blog at www.sailmotuiti.com! Our trip last year to the Bahamas was a little underwhelming to our social life. We met some really terrific people, but learned that when surrounded by an older crowd the key is to have a baby around. Otherwise, as a young couple on a small boat you may as well be invisible. 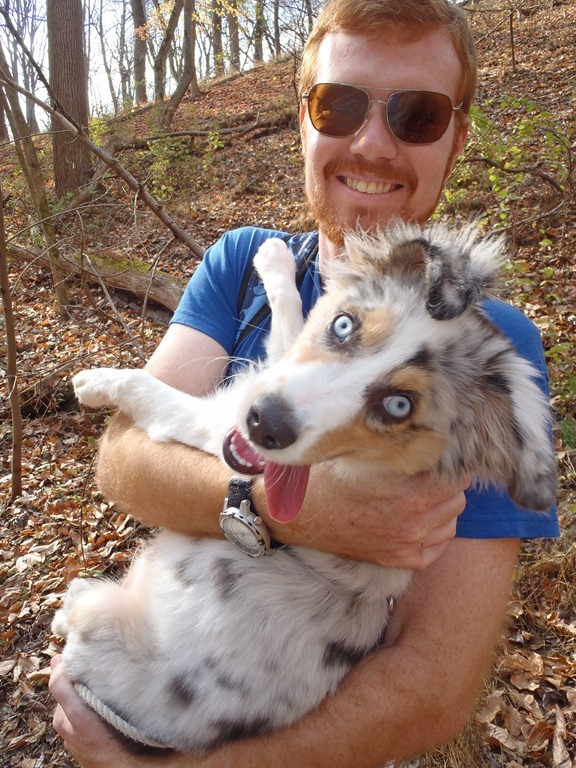 Crew is a Miniature Australian Shepherd. 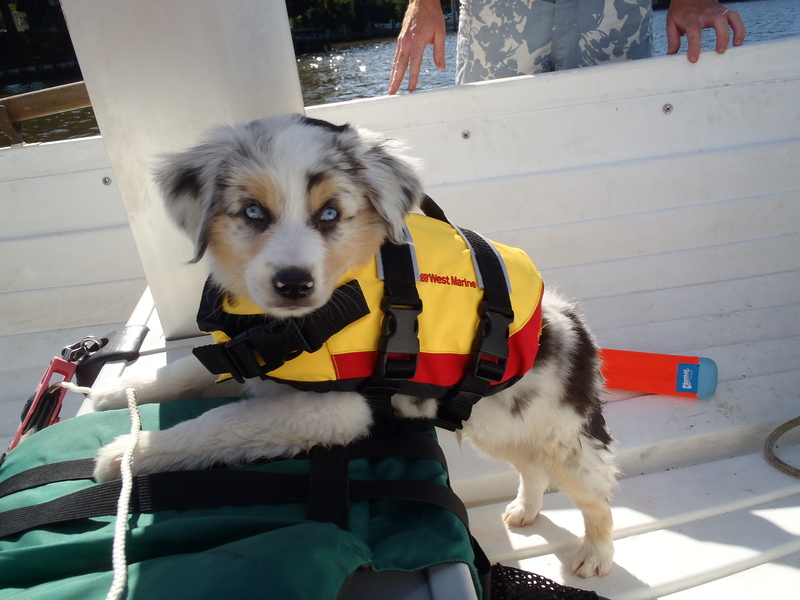 Today was his first puppy training day and he is at the top of his class with “sit” and “down.” He’s gone for his first swim, sailed in the new dinghy and likes to hang out on Velocir! Photos, photos, photos and the whole story!!! 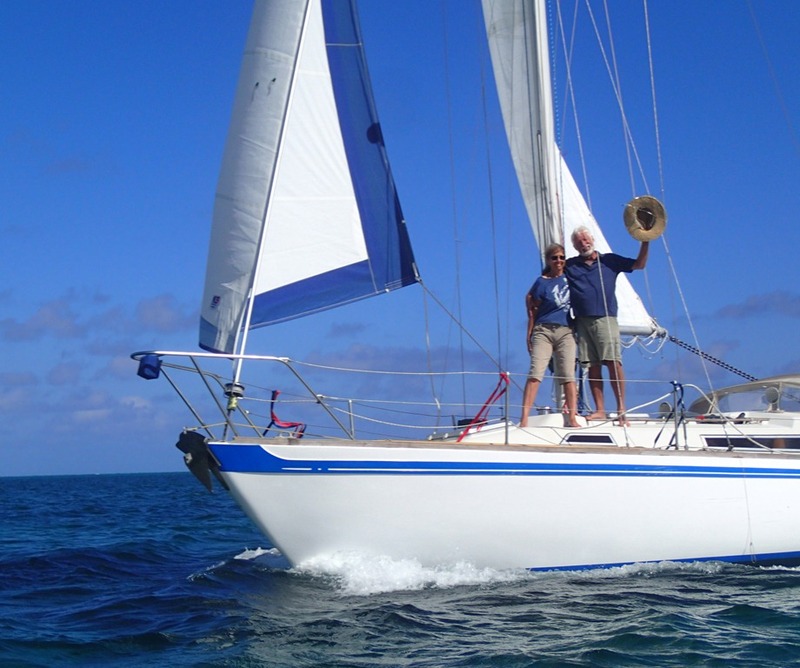 A narrated photo slideshow detailing the four year rebuild of the Albin Vega 27 sailboat Velocir. From bare hull to blue water cruiser. 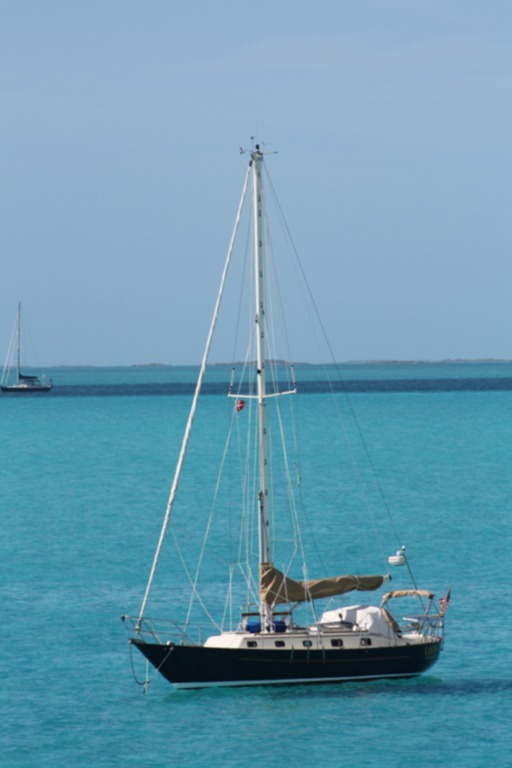 It will cover all sailing projects and endeavors apart from our cruising on Velocir. 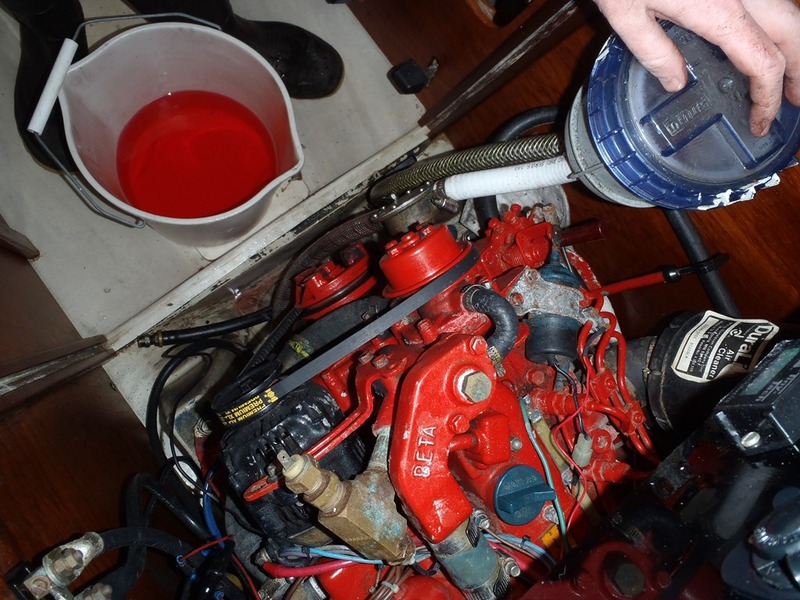 Here are the first three installments about a Camper Nicholson 31 owner fixing fiberglass, gelcoat blisters and running rigging. A guide to repair and fixing fiberglass blisters on boats. This is a common problem among sailboat hulls produced in the mid-seventies. Narrated by a Camper Nicholson 31 owner completing this project himself by prepping and filling his blisters with epoxy resin. An informative how-to on this topic with demonstration and step-by-step instruction. 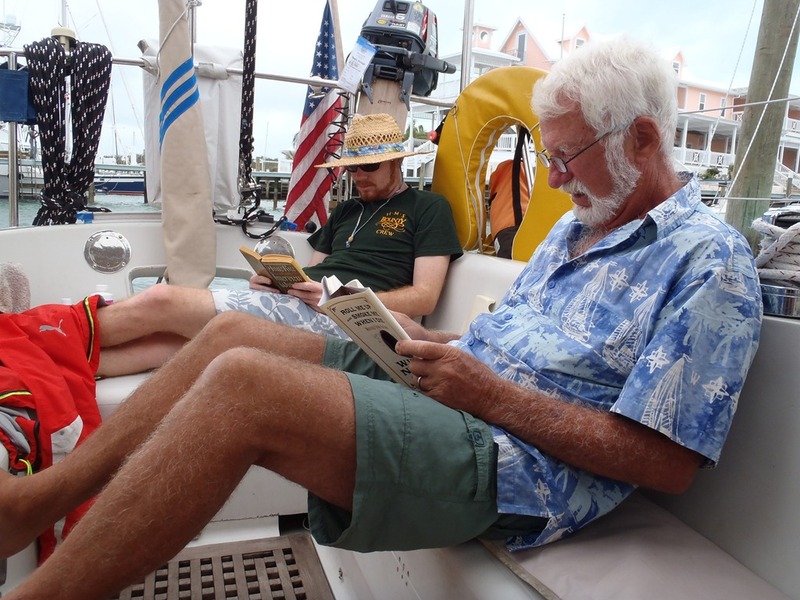 Our friend recently shared his cruising costs and trip statistics with us aboard his beautiful 37 foot sailboat. He is a singlehander, which means he cruises by himself. 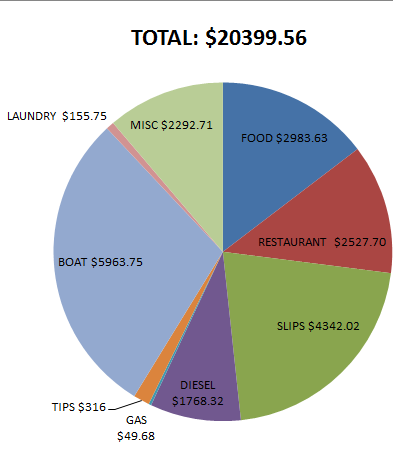 Below are his costs for 257 days cruising along the East Coast of the US and throughout the Bahamas. These costs were incurred after leaving and do not include- $15,000 or more spent on the boat or $1,100 on food provisions before leaving. Bigger boats cost more, but it is the marinas that get you. 70 days at marinas, 29 different marinas, avg. marina $60/night, avg. 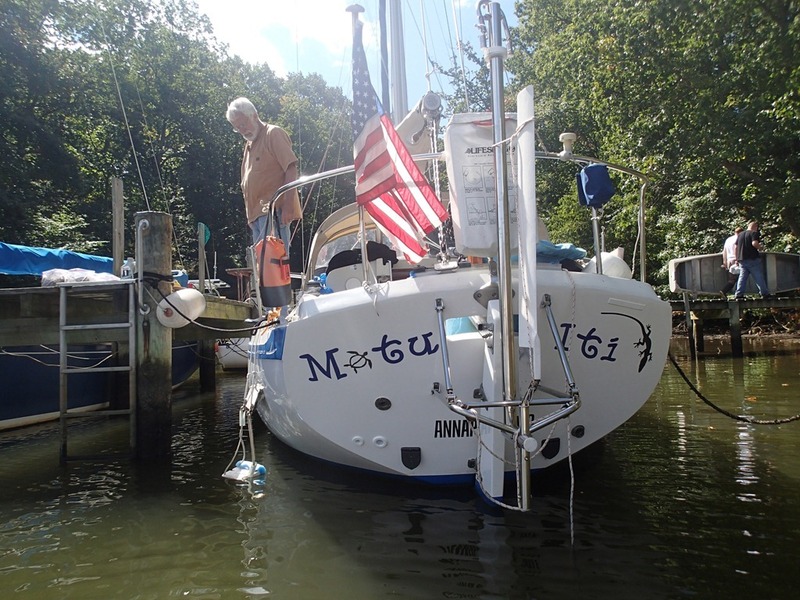 marina depth 10.6 ft.
123 days at anchor, 51 different anchorages, avg. anchor depth 10.7 ft. This trip makes 6 Gulf Stream crossings and thus far all uneventful. Water prices per gal ranged from .20 to .40 per gal and some offered daily, week or monthly rates. For the combination purchased $228.90 between December 26 and April 16.